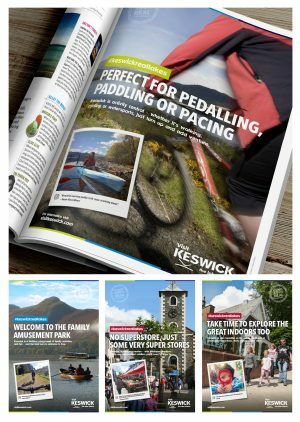 Lancaster-based creative agency Hotfoot Design has launched a new tourism campaign for Keswick using images from visitors to the Lake District town. The campaign uses images of the town shared by visitors on platforms including Instagram. Vanessa Metcalfe, Tourism Manager for Keswick Tourism Association, said: “We wanted to create something different and talk directly to a younger audience. In the past we have relied upon images of our incredible landscape, but there is so much more to this region. Charlie Haywood, creative director at Hotfoot Design, added: “Keswick is a little bit of a hidden gem in the Lakes, many people don’t venture that far north, but it’s an incredible town and the surrounding area is stunning. Fans of Keswick can post images on Instagram with the hashtag #keswickreallakes or by submitting their photos to info@keswick.org. The best will be used in a digital and print advertising campaign over the next few months.